Mom,Me and Alzheimer's blog: This Bling's for You! Leslie at Something Brilliant is Brewing gave me a wonderful new award. The Scholastic Scribe: 200: This Bling's for You! I have to say thank you very much. Go visit her blog it is a great blog about her up hill and down hill battles with losing weight which is very close to my heart. She is doing a great job I have gotten some great ideas from her about losing and maintaining my weight. This past week my Blogger family has graced me with writing about my blog on there blogs and giving this award. You guys really don't realize how important you are to my daily life. If only I could put it in words. Thank you , Thank you and Thank you. Now according to miss Leslie I am suppose to pick 5 readers to pass award to , and also tell you the rules. But I am kind of lazy so if you click on my award it will take you to the link. Which was one of the rules. See Leslie I read the rules. Anyway on the link you can see all the rules and follow them if you like . I did almost all them. Really I did. It was hard to just pick 5 Because I have 23 followers which I am so gratefully for.But I did it kind of and here they are my winners of the superior scribbler award. Congrats to all. Dolores of moving forward with Alz's . That’s awesome, Karen – thank you! I’m honored. I’m glad that you have been singled out for this award. You should be singled out for a lot more. It’s a wonderful thing you do each and every day. OH, Thank you Girly! SOOOO honored by you. I started Weight Watchers about 8 weeks ago. I'm not a big person but over the past three years I really noticed myself gaining more weight than I wanted. It was sooo depressing. I turned 50 last year and I loved blaming it ALL on my hormones and NOT the fact I was putting too much food into my mouth! I've tried South Beach (ick) and Atkins (ickyer!) and on and on. Finally I decided to TRY WW just to SEE if it was as good as people have said. I'm down 17 pounds and feel like I'm finally starting to recognize MY FACE AGAIN. I still want to lose about 20 more but not sure I can EVER maintain the weight I was pre-children. I'd be happy to lose only 12 more. Blessings to you sweets...you are inspiring. Love, Rebecca PS: Thanks for the award! I chose not to put awards on my blog though, it just makes me uncomfortable. Hope you're not offended. Thank you so much...it goes both ways. I look forward to checking on you & your mom. I have been out of town for a week for the final days & the funeral for my brother. I missed my blogs that keep me in touch with my friends. I am beginning to feel a bit of breathing space now & look forward to catching with you. Boy,, I can identify with the up & down of weight. My latest has been the funeral food diet. (on my blog) BUT, I had to have a steroid shot in my knee today, so I can see the weight going in the wrong direction as a result! Have a good week. Know that you have some unseen friends sitting there with you. Thanks, Karen! And we haven't been following each other too long. I don't know how I ever found you in blogsphere, but we connected. I love your honest thoughts and your love for your mom. Thanks guys. I am so sorry for your lose Becky my prayers are with you. I also wish good luck with all our diets during Chirstmas and New Years. I already cheated Thanksgiving. 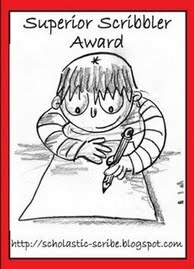 And anyone that does not want to post the award on there blog "That is OK" it won't offend at all . I am so happy that you all follow and comment on my blog nothing could ever offend me. Happy Posting. Sorry Beckie I spelled your name wrong. Me Bad. Don't worry about the spelling. I changed it back in jr high. Some members of my family still don't know that I use the ie. Just glad to be able to say I am your friend across the internet miles. Thank you so much for the award, my first! You are certainly deserving of the award. I hope all is well at your house! Congratulations Karen - thank you for mentioning my blog! Thank you all and your very welcome.